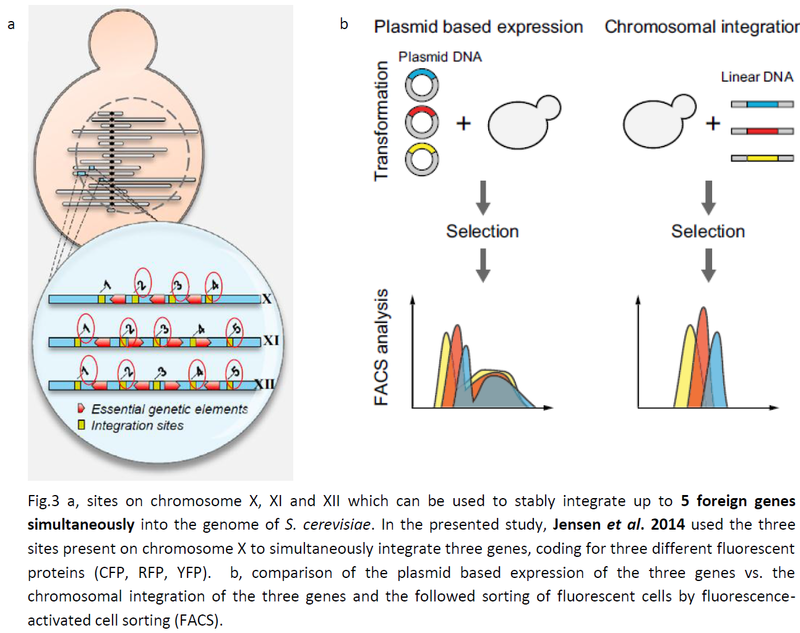 How to get several genes simultaneously integrated into the genome of Saccharomyces cerevisiae? Probably everybody in the 21st century has already heard the term “genetically modified organism” (GMO). Many people who hear this term think of something artificial or/and negative. But in fact, the basics of many methods which are used today to specifically modify organisms have been developed by the organisms themselves during evolution of the species. The aim of genetic modification of organisms is to stably transfer foreign genes. This can be performed by using additional DNA elements (so called vectors) which are maintained in the target cell besides the original genome of the modified organism. Unfortunately, there are several problems arising with the use of vectors. One problem is that a specific selection pressure (e.g. by an antibiotic) has to be maintained to force the cell keeping the additional DNA. In general, the use of antibiotics or other selection pressures in huge amounts is expensive and not suitable for industrial processes. Another problem is that a vector can only be used for the transfer of a specific number of genes. Otherwise the vector becomes too large and cannot be transferred efficiently into the target organism anymore. If several (multicopy) vectors are introduced simultaneously into an organism under use of different selection pressures, it is generally observed that these vectors are maintained in the host cell in different copy numbers. This leads to an unequal amount of foreign genes in the target organism. A further issue is the construction of vectors which often takes a lot of time and involves the use of commercially available resources which are mostly very expensive. Because of the problems arising by the use of vectors, a preferred method in biotechnology is the stable integration of foreign genes into the already existing genome of the target organism by “homologous recombination”. This term refers to the exchange of nucleotides between two similar or identical DNA molecules (Fig.1). For example, it can happen between two homologous chromosomes of diploid organisms (also in humans). Within cells the process of homologous recombination is naturally used to repair double strand breaks of DNA caused by UV-light or chemical mutagenesis, but also to create genetic variation during meiosis, the process in which gametes are generated. Moreover, this process is not only present within an organism, but is also used to exchange DNA between two different bacterial species or viruses. Some yeast species naturally perform homologous recombination and can even recombine sequences which are non-identical (homeologous). It was shown for Saccharomyces cerevisiae that it can recombine sequences which only share 52% identity (Mézard et al. 1992). Aylon & Kupiec 2004 present and overview of the process of homologous recombination in yeast. To integrate a foreign gene into a specific position of a chromosome, the gene has to be flanked by regions which are identical to sequences on the chromosome that are usually around 500 bp long (up- and downstream region) (Fig.2). Since most of the pathways leading to industrial interesting compounds exist of several steps in which different gene products are involved, it is also desired that organisms are able to simultaneously integrate several genes instead of only one gene at a time. This goal was achieved by Jensen et al. 2014. They successfully integrated three genes, coding for different fluorescent proteins, simultaneously into the genome of S. cerevisiae by homologous recombination. They integrated the foreign genes into non-coding regions of a yeast chromosome which means that no important natural genes are affected by integration of the foreign genes. The approach involved the use of integration sites in the genome of S. cerevisiae which have already been proven by Mikkelsen et al. 2012 to accept foreign DNA without affecting the fitness of the strains, while allowing high gene expression. They chose the positions 2, 3 and 4 on chromosome X (Fig.3a). In the same study, Jensen et al. 2014 also examined how stably the integrated genes are maintained compared to the same genes transferred to S. cerevisiae by the use of vectors (plasmids) which are carried by the cells IN ADDITION to the naturally present chromosomes under use of specific selection pressures. The cells expressing the three fluorescent proteins can be identified by their fluorescence signals (blue = CFP, red = RFP or yellow = YFP) by using the so called method “fluorescence-activated cell sorting” (FACS). A schematic overview of the two different methods compared in this study can be seen in Fig. 3b. 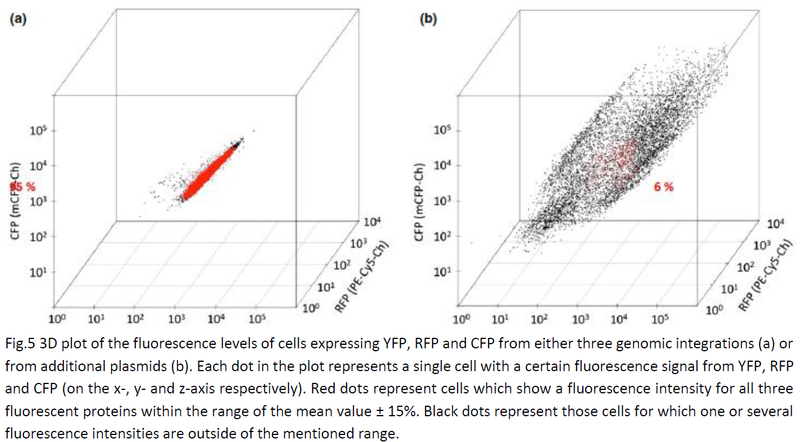 While analyzing the fluorescence levels of single cells by flow cytometry, they observed that the triple fluorescent protein production in strains containing the relevant genes as genomic integrations was much more uniform compared to strains carrying the genes on additional plasmids (Fig.4). Although the mean levels of fluorescence were in the same range for the two systems compared, the standard deviations for cells expressing the three fluorescent proteins from additional plasmids were 4-5 times larger. They determined the level of simultaneous production of the three fluorescent proteins in individual cells and plotted the data into a three-dimensional plot (Fig. 5). Each dot represents a single cell with specific fluorescence intensities. Red dots represent those cells which show a fluorescence intensity for ALL THREE fluorescent proteins within a range of the mean value ± 15%. By this analysis it was revealed that, among the cells carrying the genes coding for the three different fluorescent proteins on additional plasmids, only 6% contained identical levels of fluorescent proteins. In contrast to this, 95% of the cells carrying the genes integrated into their genome showed identical levels of fluorescent proteins. This study demonstrates the high value of homologous recombination and the simultaneous integration of several foreign genes into the genome of S. cerevisiae for the development of yeast biotechnology. Moreover, it shows the superiority of homologous recombination above the use of vectors for the stable and controllable introduction of foreign genes into an organism. Besides the use of homologous recombination for integration of genes into the host genome, this method can also be used to construct vectors containing several genes faster and without the use of expensive, commercially available resources (Shao et al. 2009). A comparison of the use of vectors and the use of integrative methods can be found in Da Silva & Srikrishnan 2012. Aylon, Y. & Kupiec, M. New insights into the mechanism of homologous recombination in yeast. Mutat. Res. 566, 231–248 (2004). Da Silva, N. A. & Srikrishnan, S. Introduction and expression of genes for metabolic engineering applications in Saccharomyces cerevisiae. FEMS Yeast Res. 12, 197–214 (2012). Jensen, N. B. et al. EasyClone: method for iterative chromosomal integration of multiple genes in Saccharomyces cerevisiae. FEMS Yeast Res. 14, 238–48 (2014). Mezard, C., Pompon, D. & Nicolas, A. Recombination between similar but not identical DNA sequences during yeast transformation occurs within short stretches of identity. Cell 70, 659–670 (1992). Mikkelsen, M. D. et al. Microbial production of indolylglucosinolate through engineering of a multi-gene pathway in a versatile yeast expression platform. Metab. Eng. 14, 104–11 (2012). Shao, Z., Zhao, H. & Zhao, H. DNA assembler, an in vivo genetic method for rapid construction of biochemical pathways. Nucleic Acids Res. 37, e16 (2009). 4 Responses to How to get several genes simultaneously integrated into the genome of Saccharomyces cerevisiae? Many thanks for your kind comments and your appreciation of our blog. We are currently preparing new articles to be posted soon, stay tuned!. Thank you, your blog it’s very useful for me. I have few questions. My target gene’s size and “part to be replaced” size need to be same? and… Could I receive the “integration site” sequence information about figure 3 chromosme X, XI, XII. I couldn’t found it. Thank you! Thanks for your kind comment. Regarding your first question, the targets in the genome are all around 500 bp long to allow an efficient homologous recombination. Your gene of interest can basically have any size (the longest one I integrated so far was ~ 7kb), even if it is more difficult to integrate longer genes. Your gene of interest is flanked by two 500 bp targets. The integration site details are provided in Mikkelsen, M. D. et al. Metab. Eng. 14, 104–11 (2012), Table S4.